Silverware There are 3 products. Hampshire Gold Plated Set includes: A. Demitasse Spoon, B. Bouillon Spoon, C. Teaspoon, D. Dessert Spoon, E. Oyster Fork, F. Salad/Dessert Fork, G. Fish Fork, H. Dinner Fork, I. Butter Knife, J. 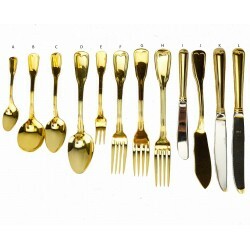 Fish Knife, K. Salad/Dessert Knife, L. Dinner Knife, Choose your desired item and confirm your rental period. 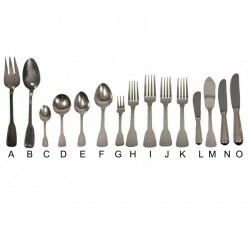 Hampshire Silver Plated Set includes: A. Serving Fork B. Serving Spoon C. Demitasse Spoon D. Bouillon Spoon E. Teaspoon F. Dessert Spoon G. Oyster Fork H. Reception/Cocktail Fork I. Salad/Dessert Fork J. 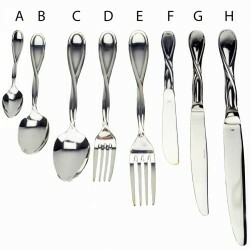 Fish Fork K. Dinner Fork L. Butter Knife M. Fish Knife N. Salad/Dessert Knife O. Dinner Knife Choose your desired item and confirm your rental period.